SAN DIEGO — The U.S. Coast Guard announced that it has interdicted a panga boat with three suspected smugglers aboard, more than 100 miles southwest of San Diego. After a Coast Guard C-130 Hercules aircraft spotted the panga early on the morning of June 18, the Coast Guard Cutter Edisto was diverted to investigate. The panga crewmembers, who claimed Mexican nationality, were throwing fuel barrels overboard when the cutter arrived on the scene. As the cutter approached, the suspected smugglers stopped and put their hands in the air, according to Coast Guard reports. The Edisto crew estimated there were approximately 250 bales of marijuana aboard, each weighing 10 to 40 pounds. 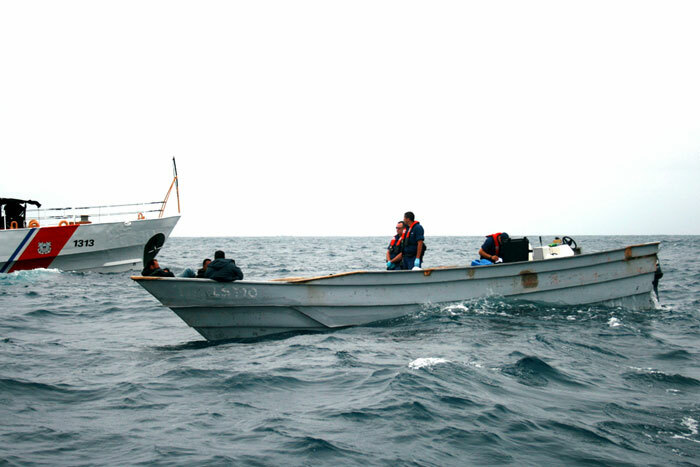 The panga, suspected smugglers and contraband were turned over to the Mexican navy.